When we first became aware that autism is a part of our lives, I welcomed Autism Awareness Day. I wanted other people outside of our family to “get it”. One day a year of proclaiming support and understanding doesn’t actually make up for a year’s worth of not getting it. Then I realized that awareness was never going to work. Each and every autistic individual is the same as everyone else in the world, that is to say unique . One individual’s experience is merely that, one individual’s experience. So learning that a child in your community is non-verbal or has sensory issues does not mean that you “know” autism. It means that you know of the characteristics of that individual. Then, as I learned more about the autistic and autism communities (autistic community being composed of individuals with autism and the autism community being their families) I realized that the blue shirt campaign is the very successful campaign of a single organization that does not recognize autistics as individuals. It is a campaign of scare tactics used to raise money by promoting autism as an evil thing that is to be exorcized from our family members. Autism is neither evil nor a tragedy. It simply is. Autism Speaks does not allow autistics to have a say on their board. It does not represent autistics. This is why I do not support the light it blue/blue shirt campaign. What I struggle with most is why anyone who is neurologically different, physically different, emotionally different, gender non-conforming, gay or any other kind of “difference” has to ask for you to be aware of their individual specific circumstances. Why is it so difficult to simply accept and include them? No one will be offended if you ask what you can do to make their inclusion go more smoothly. And please do not get me started on inclusion and acceptance in our schools, because on the surface it’s supposed to happen, but in reality rarely does. The reasons are complicated but do include the fear factor When we remove that fear, then we pave the pathway to acceptance and inclusion. Today I ask for you to ask yourself why you struggle with acceptance and inclusion and to please do something to change that. There are books on this subject, and there are many, many blog posts, most written by people far more eloquent than I. I have linked to several of them below so that you can read them and educate yourself. And find a way to accept and include everyone, no matter their individual circumstances. 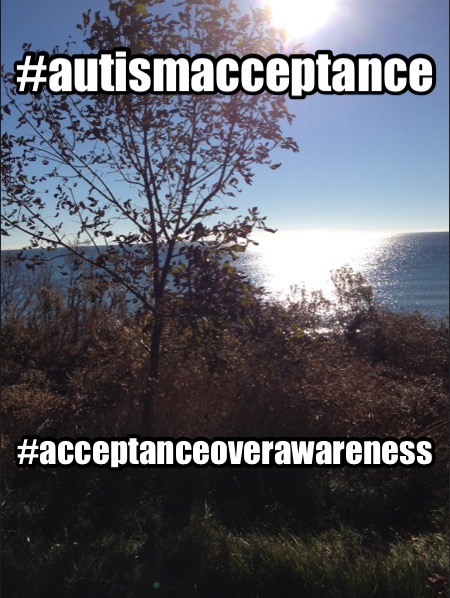 This entry was posted in asperger's, autism, inclusivity and tagged #acceptanceoverawareness, #autismacceptance, acceptance, acceptance over awareness, asd, asperger's, autism, Autism spectrum, change the world, inclusion, World Autism Day on April 2, 2015 by TeamWmom. Social media is an interesting phenomena. Lots of bickering, mommy wars, and one of the best ways to keep posted on what’s happening in the world. And when that’s all overwhelming and too much, there are always the feel good stories. They pop up, get circulated around and everyone shares them to further spread the warm and fuzzies. The latest one to get circulated is about a boy with challenges similar to autism who asked his mother not to have a birthday party for him because he doesn’t have any friends. Mom set up a Facebook page and the media picked it up and now he’s being inundated with birthday cards. How heartbreaking that his mom needed to do something like that. I get it, I truly do as I share in her despair every day. Kids with autism face so many challenges that it just doesn’t feel fair to add a lack of friends on top of it all. So many people got on board for this, that it seems like one of those heartwarming do-good, feel-good stories. Teachers were even getting their entire classes to create and send cards. Mom was even getting notices from the postal service that there was too much mail! But…after a friendless card-opening party with his mom, that boy will go back to his lonely existence. Neither your life nor his will be any better. So I’m sending a big ‘ol shame on you to all of you who shared the story and/or sent a card. Yes I said shame on you. Because you all saw a feel-good story. Some of you even spent the $5 to buy a card and a stamp. And you all patted yourselves on the backs for a job well done and went on with your lives. Nothing has actually changed. Tomorrow that boy will wake up and still face the prospect of going to school and not exchanging a single word with his classmates. If he’s really lucky a teacher might ask him about what he did last night, but more likely he or she will only direct him about his schoolwork. Whether you are a teacher or a parent, you should be using this as an opportunity to talk to your kids about exclusion and loneliness. How inviting everyone but “that” kid to your party or giving out a valentine to everyone but “that” kid is causing very real harm. Kids with special needs can’t help their behaviour, and if it seems odd to you then you need to learn to get over it. If you don’t know how then ask. As a parent, I would much rather be asked by a child or a parent about how to interact with my son than for him to be ignored and ostracized. If you are too uncomfortable to ask me, then ask a teacher. If you’re the teacher and you don’t know, ask your SERT, or me, or call the special education expert at the board. Please notice that I said “interact.” I did not say “fake friendship with.” Pretending to be someone’s friend when you really aren’t only causes harm to both people and frankly they don’t need you in their life. I’m talking about basic human interaction. A conversation. Try starting one. You might be surprised at what you discover. In fact, as parents and teachers, you should be modeling this for your children. What’s stopping you from having a conversation with a lonely person? You all know someone. Whether they are a freak, a geek, a loser, a senior, someone with physical, developmental, or mental disability; you all know at least one lonely person. To really, truly make a difference in the world, you need to speak to these people. And saying “Hi” only barely qualifies for good manners. I mean truly have a conversation. If you’re Canadian then complain about the weather with them. If you’re not, then comment on something in the news. Ask them how they’re doing. And wait for an answer. Be patient. If they are truly a lonely person then they aren’t used to being spoken to like that. They might be caught off guard or need to formulate an answer. Whatever it is, it’s not likely to be what you were expecting. And it will be worth it. Your conversation doesn’t have to be an hour long marathon to count. Just a few minutes while waiting in line for coffee or while waiting for the bus or while waiting to go inside after the recess bell. Just long enough to connect with someone who is desperate for that connection. Do it daily. It doesn’t even have to be the same person. And you never know, you might actually like someone you didn’t speak to before. And when you are doing that regularly, and only then, can you pat yourself on the back for a job well done, a difference made in someone’s life. This entry was posted in asperger's, autism, bullying, Children, friends, life lesson, parenting, special needs, teachers and tagged #startaconversation, alone, asperger's, autism, birthday cards, bully, change the world, Facebook, feel-good story, friendless, loneliness, Mom, no friends, ostracize, parenting, pat on the back, Social media, start a conversation on February 18, 2014 by TeamWmom.